The Getty Center site sits more than 800 feet high in the Santa Monica Mountains, providing panoramic views: the Pacific Ocean to the West, UCLA and Century City to East, the cactus garden punctuates the city views of the South Bay and Palos Verdes peninsula to the South, and the helicopter pad blends into the hillside surroundings to the North. It’s a site A site of impressive architecture, art, and landscaping. In my previous post, Getty Center Architecture: Work of Art with a Museum Inside, I focused on the lasting impression of the architecture. Does anyone know what type of flower this is? 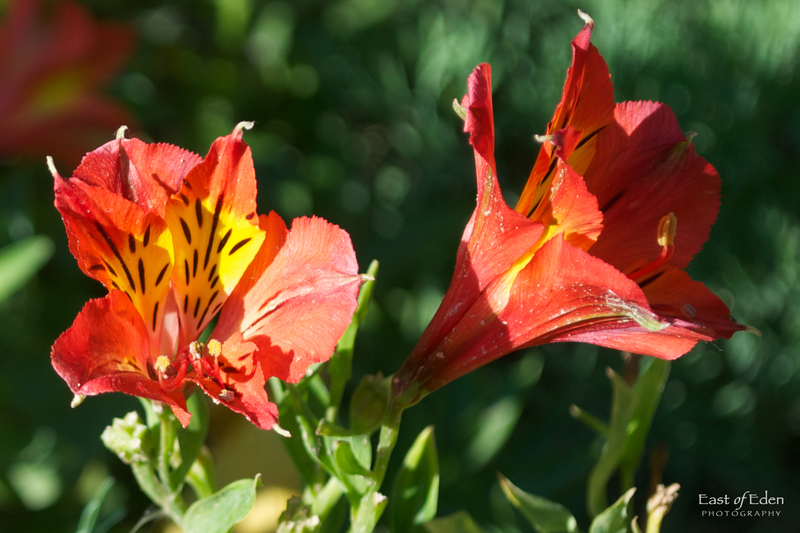 This time, let’s delve into the beautiful gardens. 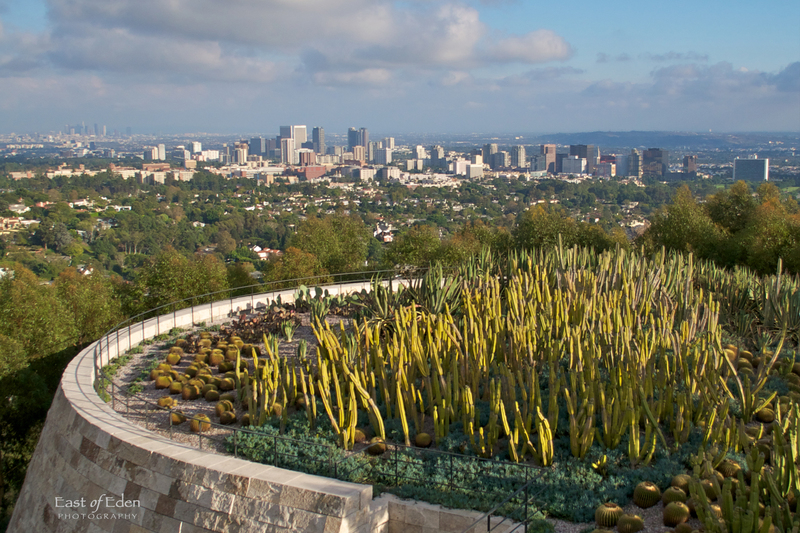 The landscaping at the Getty Center was the result of collaboration between many landscape architects and consultants. The landscaped grounds are a mix of ancient and modern, inspired by the contemporary landscapes of southern California to the traditional gardens of the ancient Mediterranean. 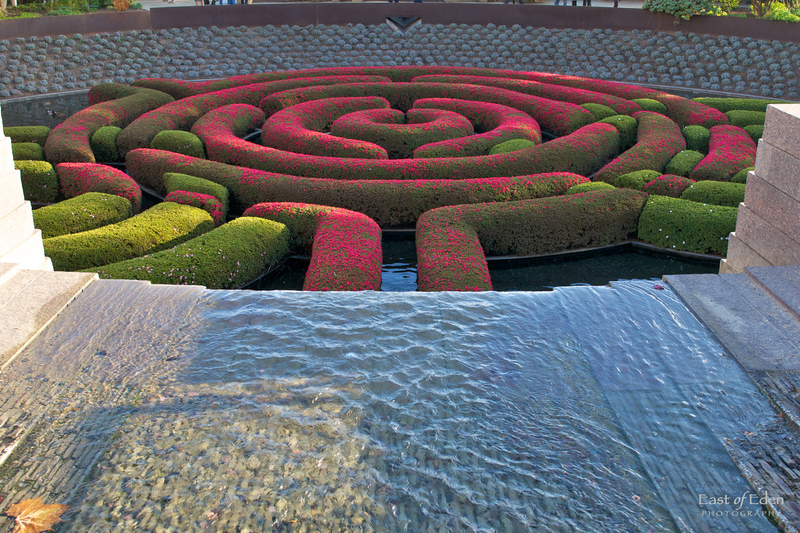 The Central Garden, at the heart of the Getty Center, is a 134,000-square-foot design featuring a natural ravine and tree-lined walkway, leading into a plaza with bougainvillea arbors. The design of bougainvillea vines growing up iron rod arbors give the illusion of trees, a favorite among the landscape design at the Getty Center’s Central Garden. Water flows down a stream and into a pool where the famous maze of azaleas float. The azaleas in the pool are laid out in three intertwined circular mazes, with the maze theme continued in the paths of the surrounding Pond Garden. From the plaza above the stone waterfall, many throw coins into the pond below and make a wish. Last year, some $1,649.03 worth of coins were collected from the Azalea Pool in the Central Garden, contributed by wishful Museum visitors. Ever wonder where the money goes? After some excavation efforts, the coins collected are given to nonprofit organizations around Southern California. 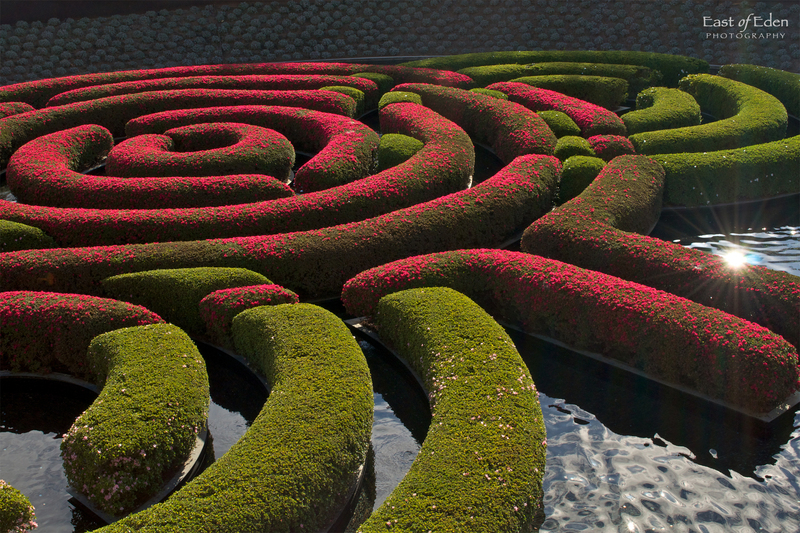 Robert Irwin designed Getty Center Central Garden, an evolving work of art, with tree-lined walkways that lead visitors through extraordinary sights, sounds, and scents. All of the foliage and materials of the garden were selected to accentuate the interplay of light, color, and reflection. Over 500 plant varieties are incorporated in the Central Garden, but the display is ever-changing with seasonal changes and the constant addition of new plants. New plants are constantly being added to the landscape. Irwin’s statement “Always changing, never twice the same” is carved into the plaza floor, reminding visitors of the ever-changing nature of this living work of art. 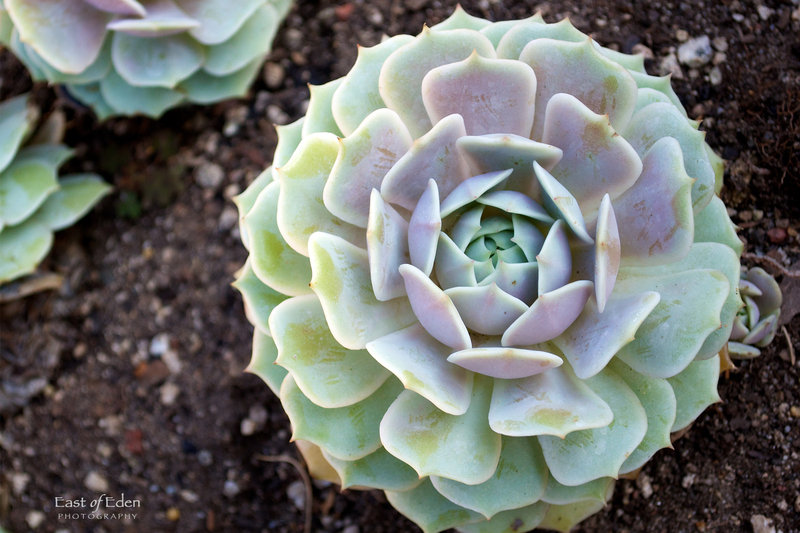 The Central Garden may be the main attraction, but don’t miss a visit to the Cactus Garden at the South Promontory, overlooking the city, mountains and ocean — on a clear day, the views are absolutely spectacular. You might think that someone named Eden would know all about gardens and flowers, but far from it. I have no idea what types of plants I photographed, so if you are familiar with these plant varieties, do share! What did I photograph here? The Getty Center was entirely privately funded and is still made free to the public. Garden Tours are offered daily. © 2014 East of Eden Photography. All rights reserved. From this boutique Los Angeles hotel, a quick ride will take you to iconic attractions like the Getty Center, Skirball Cultural Center, Santa Monica Promenade, Beverly Hills and UCLA. And after a full day of exploration, enjoy a meal at the hotels’ penthouse-level restaurant, West Restaurant and Lounge, touting stunning panoramic city views and fresh American cuisine. This entry was posted in Travel and tagged Los Angeles, museums, photography, United States. Bookmark the permalink.